AeroPress Coffee Maker | OhGizmo! Nothing can compare to a fresh cup of coffee in the morning. But which method to use? 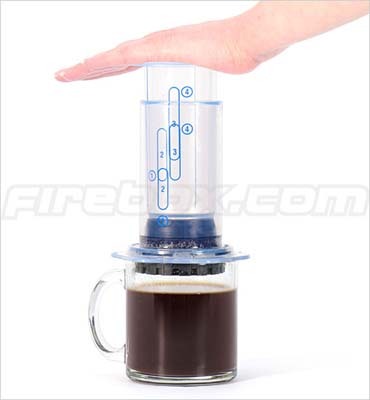 It’s not groundbreaking technology, but I stumbled across the AeroPress Coffee Maker, and I’d like to bring your attention to it. The device brings a stylish new look and one cup convenience to the french press method. Best part is that it is fast and easy to use. Just put coffee in the clear chamber and add hot water. Stir for 10 seconds and then depress the plunger. If all goes well, the air pressure will force the coffee through a micro-filter and VOILA! you got coffee in a cup in about 30 seconds. If it doesn’t go well, you got hot burning coffee leaking everywhere in under 30 seconds. The magic is in the french press method. By fully immersing the coffee in hot water, the highest amount of the oils that give coffee its flavor get extracted into the water. But also due to the rapidness of the system, the acidity is cut down. The kit includes everything but hot water, a mug, and coffee. They are very generous and supply a year’s worth of filters (they can be used more than once). All this for only $43.70 which is pretty low compared to an automatic. Best part is that you can easily take this with you, so no longer do you have to use that stupid little pot in a hotel room that makes a bad cup of joe. I have one and have given 3 away as gifts. This makes the best coffee I’ve ever had. Here’s a forum thread where the inventor Alan Adler posts frequently. Ouch, shipping to the US is 25 pounds. I can wait for my perfect cup of coffee. shipping was $9 for USPS priority, at least for me (i’m in ohio). or if you meant “to the UK”, then global priority USPS is around 8 pounds or so. This item made the cool tools list too! Erhm. What’s wrong with a normal french press? I guess I could some use for it if its filter was fine enough to work with beans ground for drip machines, but it seems that would be a pain to clean up. I just bring my own coffee (no use using a nice machine if the coffee tastes bad) and either my 100% stainless press (guaranteed to survive a nuclear attack 😉 or my french press/travel cup. Pretty good for 43.70. Looks kinda cool too! it reminds me of the way a Makinetta is working. This is an excellent portable coffee maker.